Players report to the Detroit Lions facility on Monday to start their offseason program. For first weeks it’s all about conditioning. That’s followed by a voluntary minicamp April 22-24 and then OTAs (organized team activities) followed by a mandatory minicamp June 10-12. 1. 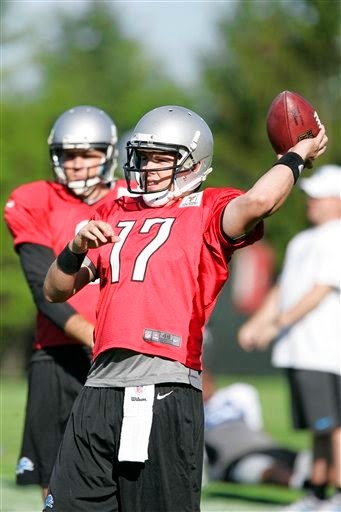 Quarterback Kellen Moore has been around for two seasons. The former coaching staff saw improvement in him in camp and preseason games. The new coaches will be getting their first look. If they’re not impressed, the Lions could draft a quarterback in the later rounds. Veteran Dan Orlovsky was signed this week. Not sure if he and Moore will compete for the No. 2 role or whether it was just handed to Orlovsky. 2. John Potter is one of two young kickers who will get an opportunity to impress. One of them is expected to replace David Akers. Potter was undrafted out of Western Michigan and was the starting kicker for the first six games of the Bills 2012 season as a rookie. He played three games for the Redskins last season. 3. Giorgio Tavecchio, an Italian-born place kicker who was undrafted out of Cal Berkley in 2012, has been in camp with the 49ers and Packers but has no NFL stats. 4. Running back Mikel Leshoure will be given a clean slate by the new coaching staff. He could find playing time in the new offense. It would help his cause to get off to a solid start. 5. Wide receiver Corey Fuller spent last season on the practice squad trying to learn as much as possible. Depth at wide receiver is an issue, a good start in the offseason could key to his future with the Lions.